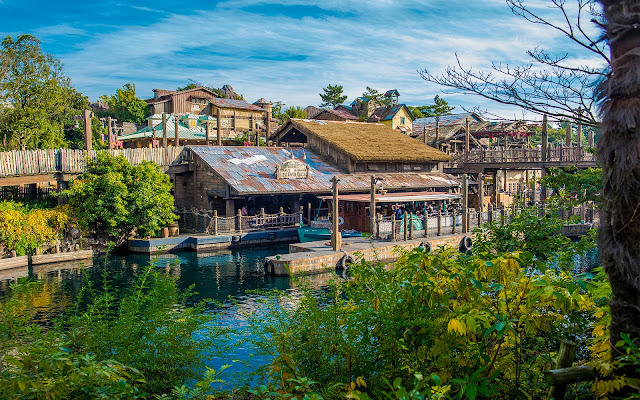 If there's one central theme that revolves around Tokyo Disney Sea, it's the spirit of discovery and adventure. The seven themed ports of call present wondrous worlds from faraway locales--some exotic, some mysterious, some electric, some nostalgic. And it's fun to find angles of the park that convey the sense of stumbling upon new and beautiful land. Certainly, it's easy to take a photo of pretty much anything at Disney Sea and provide a spectacular scene. The hyper-realism of the theming crafts a wonderland that is unlike any other--the sum of the most romantic and charming destinations combined into one. But to find a composition that crafts a little more of a story... one with layers and mood... that's even more enriching. Through the trees, one spies the landing for one of the stops of the Disney Sea Transit Steamer Line.